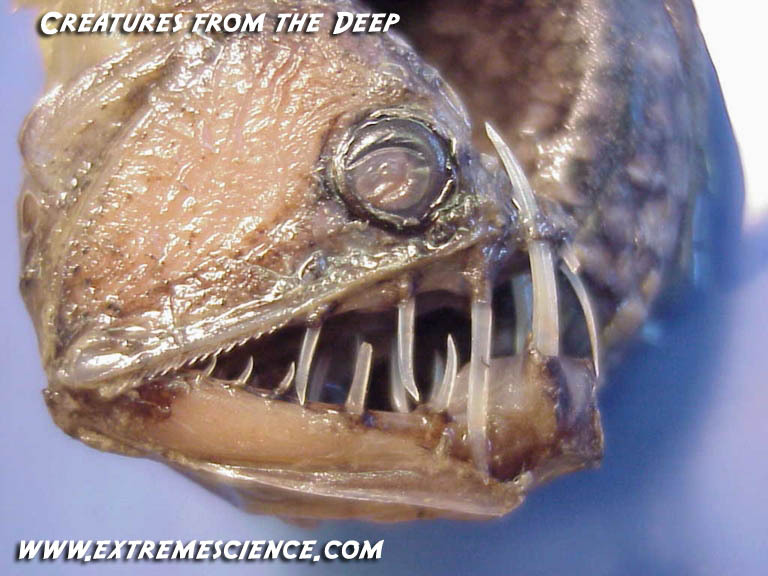 Many species of deep ocean fish have special adaptations to living in extremely high pressure, low light conditions. Some of them are black as night all over with light organs (called photophores) in strategic places on their bodies, including one on modified dorsal fin that serves as a lure for the fish it preys upon. Some deep ocean fish don't have any pigment (color) at all - they're see through. The photo at right is a hairy anglerfish (click it for an enlarged view) with lots of glowing lures to attract prey in the utter blackness of the deep. The light organs create lights by using a chemical process called bioluminescence. Other deep ocean fish, such as the the gulper eel, have a hinged skull, which can rotate upward to swallow large prey. They also have large stomachs which can stretch to accommodate a fish much larger than itself. The gulper eel is particularly well-known for its impossibly large mouth - big enough to get its mouth around (and swallow!) creatures much bigger than itself. Fish that live down here must adapt to a very low food supply, eating only "scraps" that sink down from above, or sometimes eating each other. 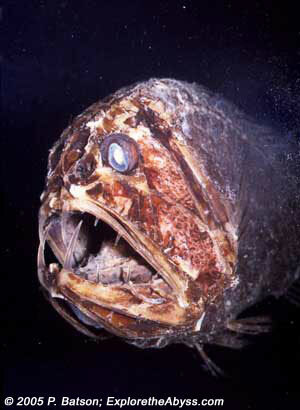 A Fangtooth - despite its scary-looking face, fangtooth fish are pretty small fish. The biggest ones only grow to about 6 inches long. 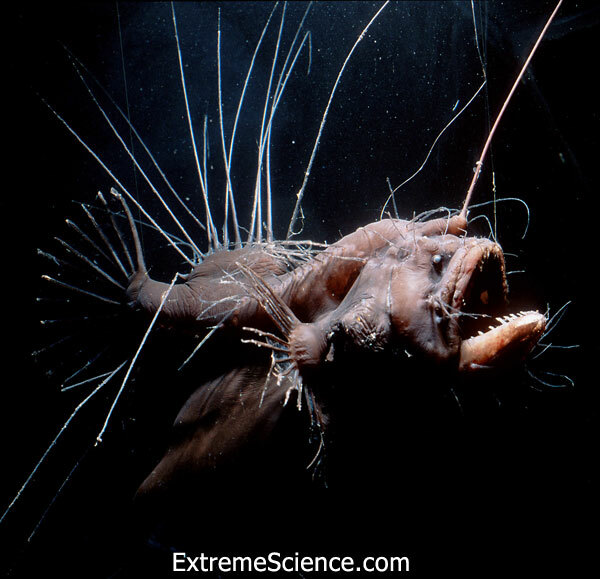 They are some of the deepest living fish in the sea, having been seen as far down as 16,000 feet deep. Adult fangtooths (fang teeth?) have an interesting adaptation for living with those giant fangs; they have holes, or sinuses, in their upper jaws and skulls that their bottom teeth fit into when their mouths are closed. They use those ferocious fangs to hunt for other fish and squid, which can be very fast and tricky to catch. They don't have any special lights or lures like the viper fish, so they move about 'blindly' in the darkness of the deep sea, basically grabbing onto whatever they run into in the dark - even if it's bigger than they are! The fangooth holds the world record for the largest teeth in the ocean (relative to body size).